YOU WANT TO GO HOME When you are out on guard on the border of No Man's Land and they've left you alone with your thoughts and the darkness, you conjure up a vision of Main Street in your home town and perhaps you tell yourself that you would give everything you own in the world-Liberty bonds and all-just for a berth on the next ship sailing for America. But would you? Would you really? You want to go back to New York. You want to see Fifth Avenue all shining in the morning sun and to push your way through the great, jostling, good-natured crowd that churns about Times Square. 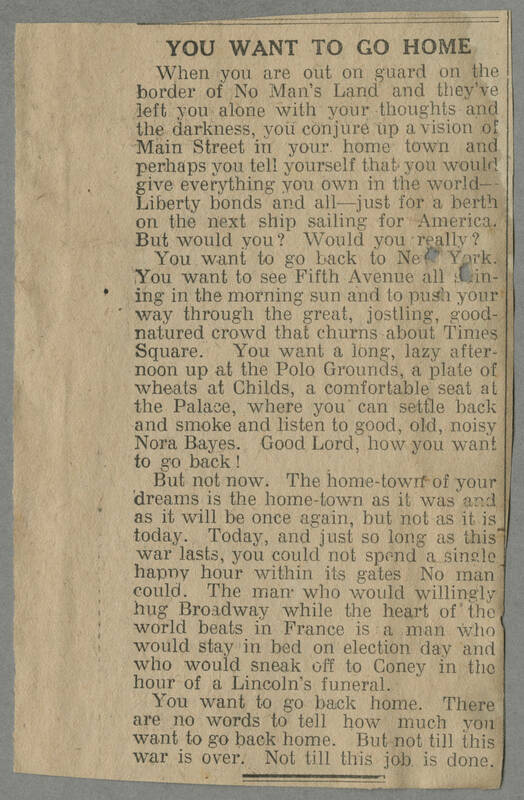 You want a long, lazy afternoon up at the Polo Grounds, a plate of wheats at Childs, a comfortable seat at the Palace, where you can settle back and smoke and listen to good, old, noisy Nora Bayes. Good Lord, how you want to go back! But not now. The home-town of your dreams is the home-town as it was and as it will be once again, but not as it is today. Today, and just so long as this war lasts, you could not spend a single happy hour within its gates. No man could. The man who would willingly hug Broadway while the heart of the world beats in France is a man who would stay in bed on election day and who would sneak off to Coney in the hour of a Lincoln's funeral. You want to back home. There are no words to tell how much you want to back home. But not till this war is over. Not till this job is done.